The benefits of mushrooms have been well studied, but research is still finding/explaining more. According to a new study, the benefits of mushrooms for the brain are worth putting out a recommendation to eat more, especially as we age. 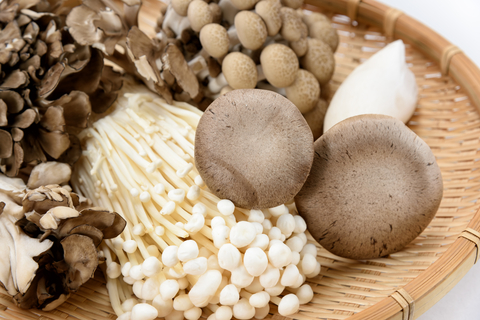 You can get more mushrooms with Maitake Beta Glucan Extract. No matter other factors (health, age, genetics) two regular sized servings of mushrooms a week reduced the odds of cognitive decline by 50%. Six different types of mushrooms, including Shiitake, were tested over several years—and gave researchers strong, consistent results. You don’t have to go overboard on mushrooms, just make them a regular part of your meals. Mushrooms can do more than support the mind. Some can stimulate and help balance the immune system, they have antioxidants that may help fight free radicals and aging, and more. Also a plant based source of protein with a delicious savory flavor, it’s worth throwing some in your favorite dishes. If you don’t want to change your recipes or aren’t big on cooking, you can get three of the best mushrooms in one capsule with Maitake Beta Glucan Extract. Not only do you get a daily dose of mushroom to help boost your mind, but the benefits of three of the most powerful mushrooms to help boost your immune system and more. Finding the more rare mushrooms can be difficult in some areas, and are even more hard to find of you’re foraging. Get an antioxidant boost, immune system boost, and mind support with a daily dose of beneficial mushrooms with Maitake Beta Glucan Extract.